if you are looking for an easy dessert idea, you have come to the right place! 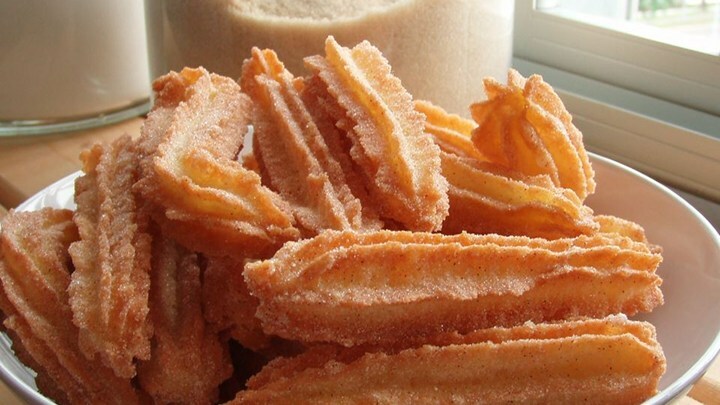 These Bisquick Churros are my favorite. They are so easy to make and you can throw them together at the last minute with little to no fuss. in 3-quart saucepan, heat oil (2 to 3 inches) over medium-high heat until thermometer inserted in oil reads 375°F. In small bowl, mix 3 tablespoons of the sugar and the cinnamon; set aside. In medium bowl, stir Bisquick mix, hot water and remaining 1 tablespoon sugar with spatula until dough forms. Spoon dough into pastry bag fitted with 1/4-inch star tip. Pipe 5-inch strips of dough into hot oil. If necessary, cut dough with knife or scissors between each churro. Cook 2 to 3 minutes, turning frequently, until golden brown. Carefully remove from oil; drain on paper towels.